Two days later Donald and his nephews shiver in Uncle Scrooge’s Scottish castle, tailfeathers huddled against the glow of its single roaring coal. "Central heating!" Uncle Scrooge pops his pince-nez. "I'm the Richest Duck in the World! I own three cubic acres of cold cash in my money bins! I own uncountable oil wells, gold mines, railroads, factories and fish houses! I'm worth one multiplujillion, nine obsquatumatillion, six hundred and twenty-three dollars and sixty-two cents! You can't tell me how to keep warm!" And tugs his ragged shawl tighter. "Then why (chatter! chatter!) did you send for us, Unca Scrooge?" He holds up a magazine he had found in a trash can in a Glasgow park. The little ducks flap up and down. "Jason and the Golden Fleece!" cries Hughie. "The Golden Fleece was in a cave guarded by the Sleepless Dragon!" "That's why I sent for you!" snaps Uncle Scrooge. "I want you to get me that Fleece!" "The Golden Fleece!" Donald squawks. "But there is no such thing! That's just a legend!" "Legend phooey! They discovered the ruins of Colchis, didn't they?" "But Unca Scrooge!" quacks Hughie. "What do Colchis and the Golden Fleece have to do with heating this drafty old castle?" "Hang the castle!" Uncle Scrooge's ear-whiskers bristled. "That would cost money! I only want to warm me!" "All I need to keep me warm —" opening his shawl and coat, "— is a new coat!" "A new coat!" the nephews chime. "Not just any coat! I bought this old broadcloth I’m wearing at a rummage sale in Edinburgh in 1902. No - what I want is a coat fit for the World's Richest Duck!" Thumbs cocked in old coat, bill tossed with magnificent hauteur: "A new coat made of — Golden Fleece!" My keenest memories of Disneyland are always of the rides I did not go on. Disneyland held its grand opening on July 17, 1955. It was on TV, but I did not see it because I was at Camp Calvert in southern Maryland, where not having television was part of roughing it. It’s possible that, thanks to the previews on Disneyland, the TV show, I had a dream or two about it before July 17th. But over the next two years I counted fourteen different dreams of going to Disneyland. In none of them did I ever quite get there. Once I got close enough to stand beneath the darkened technicolor splendor of Sleeping Beauty’s Castle like the Scarecrow at the doors of the Emerald City. But I knew I would not enter the Castle before – I didn’t know when. Disneyland was in California. Everything was always in California, and all the dreaming in the world could not move it one inch nearer Kensington. So there was only television, and the man himself: the familiar bulk seated on the edge of his desk, the shrewd warm twinkle and confiding chuckle, the friendly unassuming sweep of his enchanter's arms as he ushered a living room tour through a new corner of his magic-factory. Then July 1957, starting my second long week in sunny, hot, still, small, uncomfortably over-friendly, unbelievably boring Wabasha, Minnesota, at Grandma Foley’s house, I received a letter from my mother which was an irruption of the impossible into the unimaginable. It was, I later put it, an undreamt dream come true. What can anyone say about Disneyland that has not been said? Disneyland defies reduction to words. It challenges the writer to create, in words, an objective correlative that “does not mean, but be.” Now that’s a dream! I don’t want to describe any of it, especially the art direction. The more realistic the sets – like the half-thatched arch to Adventureland – the more artificial they look; and the more unrealistic – like the pink and turquoise turrets of Sleeping Beauty’s Castle, or anything in Tomorrowland, the more authentic. Because only what does not try to look realistic is authentically what it is, and not something it isn’t. Main Street is the richest fantasy in the park – appropriately, for through it the visitor must first pass to all the other lands, and leave the unrich world behind. I don’t want to describe the cornices of Main Street – I want to bite them, and not let go, and not leave teeth-marks, either. Wedding cakes never look so good. People complain about the crowded lines in Disneyland but forget (in my case till I watch the home movies again) how much the crowds are part of the excitement: crowds within crowds, going every which way: a crowd looking downriver for the Mark Twain Sternwheeler coming round the far bend; a crowded raft gliding near sinking toward Tom Sawyer Island, a many-bodied Indian canoe sliding past it the other way; up the far shore crowds streaming toward the Indian Camp, a dozen white-wimpled nuns among them; nearby another crowd sitting under umbrellas at a cantina, parties walking back and forth all round. Like a three-ring circus, only greater: too much going on everywhere, all at the same time, you can’t keep it all straight; only you’re in the rings yourself, participant as well as spectator. Every amusement park is like this, but Disneyland multiplies and, by its layout and architecture, divides and routes the crowds in all directions of the compass -- pouring over the stone bridge into the gate of Sleeping Beauty’s Castle, or toward the gardens of the Monsanto House of the Future – in every Land the day fresh as the sunshine. I could reconstruct a chronicle of my five visits (1957, 1960, 1981, 2006, 2007), with my parents and sisters and then with my wife and two kids. You might enjoy that. I doubt it, but I know I wouldn’t. “I rode this, then I rode that.” It can make a tale to tell a tribe of other children, but the tale will always fail. Because listenin’, and readin’, ain't ridin’. Yet I can’t leave it at that. I’ve got to tell. Although it would be years before I could make the analogy, I was the kind of Ancient Mariner-kid who is almost spasmodically compelled to tell you every last detail of everything I can remember, to pinch the last squeeze of excitement out of whatever the telling could make come alive again, and again, before possession by the experience left my body for good. Tom Sawyer’s Island. I’d climbed all over it, up into the stockade towers of Fort Wilderness, run through the enormous fiberglass-rock cave ... but that was just it. I ran in the sticky cloud of dust kicked up by a hundred other running sweating kids – but without my own friends. We could have done that island like nobody else; but I was a ghost among all those Southern California kids who swarmed it like cockroaches. And the boats. I missed the boats! Saw them from the Autopia and from the Sky Buckets, walked by – why didn’t I go on them? Did I not see them? No, I must have seen them, they were right there. I must have thought I’d come back in an hour, whenever it was; everybody anxious to get out of Tomorrowland into Fantasyland or Frontierland. Could always come back. But we left before I went back, so ... I missed the boats! And the Crane Bathroom of the Future. I discovered that only when poring over the Disneyland brochure a day too late. We toured the Monsanto House of the Future, but I never heard of the Crane Bathroom of the Future until we were far away. Bathroom of the Future – what could that look like? Next time, first thing, I’d go on the boats. Then tour the Crane Bathroom of the Future. But when would that be? In 1960, when we went back, I steered us first to Tomorrowland, but this time it was for the new Atomic Submarines – one of them even named after the first atomic sub, the Nautilus, itself named after Captain Nemo’s submarine from 20,000 Leagues Under the Sea. I wanted to go next on the boats I had missed three years ago; but at some point – maybe from the Sky Buckets between Tomorrowland and Fantasyland? – from some angle at any rate, I noticed that the boats I had missed, which I had been sure would be as free as the Autopia cars in the water – the boats were on tracks. The Crane Bathroom of the Future ... missed it again. With trim beard, perfect British English, and perfect manners Captain Nemo led Professor Aronnax on a tour of the Nautilus. He had studied the Professor’s writings. More than the Captain’s luxurious salon had entranced the Professor, with its vermilion divans, spectacular organ, paintings, scientific library, aquaria of exotic fish, and the giant porthole through which they viewed those wonders that defied even Nemo’s powers of description. The submarine boat itself, powered entirely by electricity, was a marvel to equal any other creature of the sea. But the source of that electricity excited the Professor’s utmost curiosity. Captain Nemo, determined to show the Professor everything, took him to the very heart of the Nautilus, the propulsion unit. In a hundred flickering little round windows colored fires whirled in a high-pitched din, while a crewman monitored and gently turned a wheel. The Captain lowered a leaden mask to screen the Professor’s eyes, then, averting his own, slowly raised the furnace door upon a source of burning light whiter than the sun. It is apparent, the Professor recorded in his log, that Captain Nemo has discovered what mankind has always sought, the veritable dynamic power of the universe. This secret alone gives him mastery of the sea. “Or destroy it,” the Captain replied. I do not know if there is any special significance to this number, ironic or otherwise. 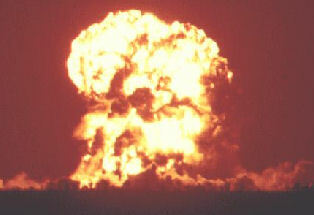 But on May 5, 1955, an atomic bomb was detonated on live TV at Yucca Flat, the Nevada Test Site of the Atomic Energy Commission, 65 miles north of Las Vegas. 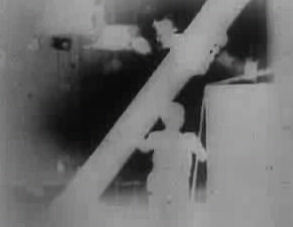 It was not the first atomic blast on live TV; that had been Operation Doorstep, March 17, 1953. But it was the one I watched, between wolfing down breakfast and jumping into the car for school. To be precise, because the blast occurred at 8:10 a.m. EST, I cannot swear that I was in front of the TV to see the flash white out the screen. I had certainly watched with great excitement through the countdown, and begged to wait just until the blast before jumping into the car. Other guys, who lived closer to Holy Redeemer, saw it, and we all talked about it. It was so neat! For sure I did see the film footage on the news the next two evenings. I still see it. This test, named “Apple II,” the second of a series of 40 “projects” collectively named Operation Cue, and a “mere” 30 kilotons, was conducted for the Federal Civil Defense Administration to study the effects of an atomic bomb on civilians. Operation Doorstep had done a little of this, building two white frame houses complete with mannequin families. But now a “typical American Community” was built, ranging roughly from 2/3 of a mile to a mile-and-a-half from the blast tower: two two-story and three one-story houses constructed of different materials from wood to reinforced masonry, an electrical transformer station and substation, a radio station, a propane tank gas station, a weigh station, and other buildings. The highlight was a community of mannequins dressed as typical Americans, some sitting around the television in the living room, father mannequin stiff in suit and tie; some sleeping in trailers. Actual canned food stocked the kitchen shelves and refrigerators, including frozen food flown in from Chicago the day before. A row of mannequins in dresses, business suits, and casual wear stood outdoors facing the blast site, to test fabrics and color fading. The set-up was featured on news shows over the days leading up to the big day. The first time I ever heard of an air raid drill was First Grade. I was out sick one day and phoned Danny for homework. He was all excited. He told me they had an air raid drill that day, and had to go into the hallway and say the rosary. I thought he said ear aid or hearing aid drill, or ear-ache drill. “What’s that?” “In case an airplane flies over the school and drops a bomb on it!” “WHAT!” Danny laughed. “Yeah, we had to go out in the hallway and say the rosary.” “Why would an airplane drop a bomb on the school! ?” “Just in case.” “But-but WHY! Why would it DO that? !” At some point he must have specified Russian airplane, which suddenly made more sense, but scared me just as much. Communists were killing American soldiers in Korea. “Can they fly this far?” “I don’t know! That’s just what we’re sposed to do if we’re bombed!” “They going to have another one tomorrow so I know what to do?” “Foley, you just got to go into the hallway and kneel down and say the rosary.” They did hold one or two more air raid drills. On TV they showed kids getting under their desks. That looked neater than filing into the hallway, two by two, to kneel down and say the rosary; but saying the rosary did sound smarter. Except I didn’t want to think about it too much. 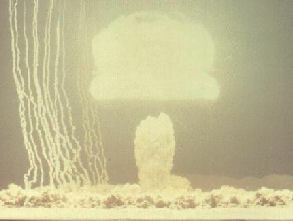 If an A-bomb dropped, I’d rather be home, where we could throw ourselves down on the grass and cover our heads. At least it would be more fun. 5-5-55 came at the end of Fifth Grade. Maybe because there hadn’t been any real air-raids in the years since, and they no longer ran public service announcements on how to tell an air-raid siren from a fire siren, I was no longer as afraid as I had been in First Grade. The Russians had the A-bomb, but now we had the H-bomb, and soon we’d have the C-bomb, the cobalt bomb. We were way ahead. The official observers, in a trench miles away, had to wear dark goggles or look away during the blast, then look back at it. Because the blast whited out the TV screen, I don’t actually remember the blast itself. 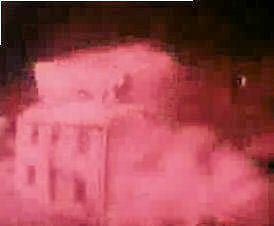 I remember the blast reflecting against the white side of one of the houses, as it had in film of Operation Doorstep. 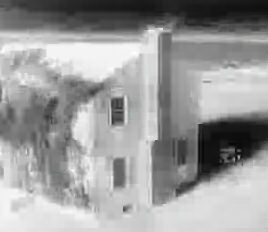 On-line footage brings it all back, and corrects memory: slow motion smoke running out of the windows, snaking over the roofs; then the shockwave, even in slow motion sweeping like a hurricane: houses exploding into flinders in a huge dust storm; side of a wooden house shivering into flame, flying up away. another boy mannequin sitting unharmed under a basement lean-to, the ruins of the house all about him. The expressionless expressions on their mannequin faces unchanged. Those unchanged expressionless faces, even decapitated from their blown apart bodies, were almost reassuring. 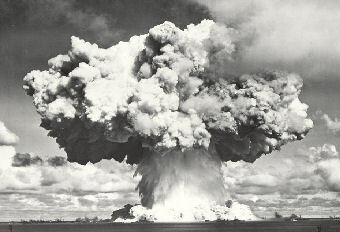 An atomic bomb could be survived, in a way. Now we got to see what it looked like, and how to protect ourselves better. 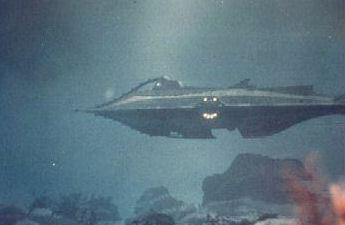 In the dark I watched Captain Nemo. "Look! Rorapandi – the White Man’s Grave.” Captain Nemo gave the Professor his telescope. Tomorrowland had barely made it to opening day. Although part of the plan from the beginning, for budgetary reasons once park construction began it had been neglected like an afterthought. After 20,000 Leagues Under the Sea was released in December 1954, however, its huge success moved Walt to go for broke – total concept or nothing. He wanted his amusement park to be More Than an Amusement Park. With only six months to go, Tomorrowland was back on the map. But it was not so much hurried as lacking in ideas. He had aired two “Tomorrowland” segments dealing with space flight on TV Disneyland – “Man in Space” and “Man and the Moon” – so there would be a Rocket to the Moon ride, for sure. (More an exhibit than a ride, actually: a little theatre-in-the-round with round screens on floor and ceiling, and seats that vibrated as your Rocket took off. You could watch the Earth falling away on the floor screen and the Moon approaching on the ceiling.) Astrojets, similar to the staple airplane or rocket ride at any amusement park. The Super Autopia Freeway – which projected every kid’s immediate tomorrow (age 16) – was the only original ride conceived for Tomorrowland. The other “attractions” were not really Disney efforts but exhibit spaces leased for showcases by Kaiser Aluminum, Richfield Oil Co., and the Crane Bathroom Company. with predictions of constructive things to come. Once Disneyland opened ... failure was left outside the gates. Disneyland, in its opening summer of 1955, turned out to be a phenomenon that defied failure. This it demonstrated the very opening day. Everything went wrong ... and an unbelievable time was had by all! “Fiasco!” howled the TV critics. But watch the kinescope. It’s preserved in DVD (Walt Disney Treasures: Disneyland), and it’s good old ‘50's live TV at its most hilarious. Goofy, not Mickey, was the spirit of the day. Fifteen thousand guests were invited – mostly Disney staff and families. Almost thirty thousand came, some over the back fence. To judge by the DVD, notwithstanding all the miscues and dead air moments, blackouts and mis-communications – no less than Walt himself, at one point, forgetting there was such a thing as Adventureland! -- it did not matter to anyone in the least. Nobody left a sense of humor at home. Witness the inauguration of Tomorrowland itself, and its very first Science-Factual demonstration. Bob then introduces one of those scientists. Tan, lanky Heinz Haber, who is already writing the book Our Friend the Atom and will host the TV show a year-and-a-half later, presents a brief lecture on how the atomic energy system of nature – from the sun to the ocean to the clouds to rain to water power to electric generators -- will soon give way to a short-cut with an atomic pile. He grins, unconscious of the malaprop. 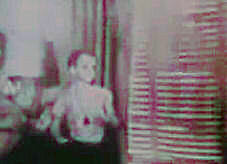 Bob Cummings tries to hide his own widening grin, and earns a gold star for self-control as the screen lurches to Autopia, and Art Linkletter, looking for stars in little cars. When “Our Friend the Atom” aired on Disneyland in January 1957 – seven months before my first visit to Tomorrowland – it was love at first sight. The book version of the show was the only thing I asked for my birthday two months later. I still have it. Generations of the late- and post-Cold War eras might find it difficult to enter the imaginations of the Atoms for Peace era. The “Atoms for Peace Plan” was an Eisenhower vision of turning the great villain into a great champion – or, to adopt the modest note of the show and the book ... a friend. Walt Disney became an enthusiastic partner in the vision; engineering (and its muse, Science) had always been at the heart of his own imagination. But one only has to read the book or watch the show to realize “Our Friend the Atom” is no mere propaganda. No one in those days could embody a vision and excite a young imagination like the Imagineers of the Disney Studio. The progress of science since the 17th Century, including the development of atomic theory, is hardly sacrosanct or immune to criticism on grounds of epistemology, among others. (See “Eschatology of Reason: De Rerum Natura,” C. Parcelli, FlashPøint #8.) The only philosophical criticism the book’s author, Heinz Haber, recognizes is the Aristotelian, which Galileo and descendants slowly undermined by practical experiment. No objections from any 20th Century philosophical perspective are noted. The simple strong focus of the book is making the dense history of atomic theory understandable and appealing to 13-year old boys. As a boys’ first book of atomic theory, it’s a clear, fluent, and colorfully written and illustrated introduction -- leading the young intelligence to new knowledge, but neither overwhelming, nor condescending. No small achievement. To reread the book after half a century is to fall under its spell again. 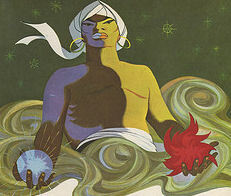 It opens with the Arabian Nights’ tale of the Fisherman and the Genie. There once lived an aged Fisherman, who dwelt in poverty with his wife and three children. Each day he cast his net into the sea four times, and rested content with what it brought forth. It brings forth a small brazen vessel he pries open, only to be astonished and terrified by a mighty Genie, who commences to regale the old man with the tale of why he will now kill him, until in his terror the old man has the wit to beg that before he dies the Genie prove how such a mighty being can fit into a little vessel. The proud Genie demonstrates; funnels back into the vessel; the old man thrusts the leaden stopper back into it; and is about to throw it back into the sea when the Genie swears by Allah he will grant three wishes to make the old man rich and happy all thy days if the Fisherman will only let him out again. The Fisherman takes the Genie’s vow on faith, lets the Genie out again ... and the Genie keeps his word. And so we are ushered into a fabulous realm, where upon the intent wonder of scientific eyes a purple dusk is cast by a dish of light luminous as the sun. After the Fisherman come Democritus and the atoma, Galileo’s telescope, Luuwenhoek’s microscope, Gassendi’s refutation of Aristotle, Newton and the particle theory of light, Robert Boyle and Antoine Lavoisier (guillotined by the Revolutionary Tribunal), John Dalton’s atomic theory, Roentgen’s X-rays, Becquerel and the photgraphic plates, the Curies whittling uranium down to radium, electromagnetism, Einstein’s E=mc², Rutherford’s atomic shooting range, the Periodic Table of Elements, Hahn and Strassman splitting a uranium atom in the Kaiser Wilhelm Institute – the mousetraps and the ping pong balls. Leaving aside the panegyric epilogue on the three promised blessings of atomic power -- atomically enhanced food, health, and world peace -- Our Friend the Atom is a book of wonders. The Disneyland show, while subsequently used in science classrooms throughout the country, is essentially a promo for the book. As a show it follows the format established in Disney’s wartime Victory Through Air Power. Convinced by Alexander de Seversky’s bestseller that World War II could only be won by long-range strategic bombing of war industries, Disney mixed live lecture with animation, in a variety of styles, to make the case. (The U.S. Navy, which had financed many of Disney’s wartime training films, was incensed by de Seversky’s claim that air power had eclipsed naval power, so Disney was forced to finance the film himself – a measure of his commitment.) 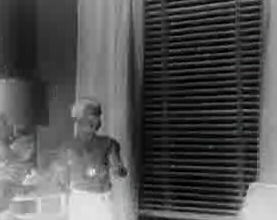 De Seversky and the animation make so clear and cogent a case, even James Agee, no Disney fan, was more impressed than he cared for. When Disney is attending strictly to mechanics and to business, it is good poetry and, barring its overpersuasiveness, good teaching. Bob Thomas’ “authorized” Walt Disney: An American Original quotes a story of John Gunther’s in Taken at the Flood that Winston Churchill ordered a print of Victory Through Air Power flown to the Quebec Conference, summer of 1943, to show FDR. Excited by it, FDR showed the film to his Joint Chiefs of Staff, and they all acceded to Churchill’s insistence on air dominance of the English Channel as the vanguard of Operation Overlord. The showing to FDR might also have done something for the Army Air Corps’ long-range bomber program. In the first moments of his presentation in "Our Friend the Atom" Dr. Haber notes: “The world was deeply shocked by the first atomic explosion. We all wondered if atomic energy had better remain a secret forever.” He did not – and did not have to – mention that it was an American long-range bomber that produced that deep shock to the world. Let me be clear: Walt Disney did not split the atom, or build the bomb, or drop it. It all would have happened without him. The propaganda of Victory Through Air Power might have made some difference in the planning of the Normandy invasion (although the night-before air raids were largely a failure). And the Enola Gay took off, not from the de Seversky-Disney vision of force-efficient Alaskan land bases, but from the Japanese home island of Tinian – in complete rejection of de Seversky’s judgment that island-hopping could only produce an enormous, useless, and inefficient waste of American lives. But the A-bombs were dropped on Hiroshima and Nagasaki, the Japanese surrendered, American war industries triumphed, Disney cheered with everyone else – then proceeded to suffer a breakdown, abandon his studio to his brother, immerse himself in flushing out Hollywood Communists, and play with his trains. Months and years passed, with many other projects to preoccupy him, until the vision of Disneylandia (as it was first called) arose, which would celebrate the American past, world fantasy, and – what else? – a future that would not be blown up. Jules Verne’s all-electric Nautilus is powered by an undescribed, but avowedly inexhaustible, mixture of sodium – extracted from seawater – and mercury, heated by coal from an undersea mine. Disney’s Nautilus goes Verne one better: not only is the mixture undescribed, it is unnamed. But, it is hugely hinted, it just might be atomic energy itself -- “the veritable dynamic power of the universe,” as Professor Aronnax marveled. I liked Nemo, though it felt wrong to. At first I’d hated him — the ship-sinking murderer, with his beard and perfect English English and perfect manners. I’d cheered Ned Land and his muscular, All-American sneer for all that. But – either during the first viewing or the second, or the third – that changed. After I saw how much Nemo knew about the Professor's own books and all of the most up-to-date writings on science; after I’d toured the miracle of the Nautilus, and peered into the beam of white light pouring from its power source; after finding out how Nemo had been sent to the prison colony, an innocent man, and what had happened to his wife and little boy -- all that changed. And yet the more I came to like Captain Nemo, the more it troubled me; the more afraid and the more excited I became whenever, once again, he shut himself in his salon, among his bookcases and rich furniture and exotic fish, sat down again at the throne of the tremendous organ, whose brass pipes shone like a giant golden seashell against a heavy drape of dark red. And, lips moist and proper, eyes sharp under the oval mirror above the keys, Captain Nemo pulled out the stops, leaned back, and began to play. Through the silence of the rest of the ship they could hear him playing, his fingers climbing up scale after scale, thundering chords (of Bach’s “Toccata and Fugue in D Minor”). Up and down the music would run, climbing and descending -- thundering. Wild sorrowful screams would howl from the organ's pipes. Pain opened Nemo's bearded lips and his eyes stared wild and helpless. Faster and faster into the thunder his fingers worked; the pain shook sweat from his eyes and lips until the music raged. And then abruptly he stood up. Breathless, staggering a little, he’d pause by a desk to touch the daguerrotype of his wife and son, and then resume, with a slightly drunken, stiff movement toward the Helm Room. In the eye of a telescope the masts of the warship would be emerging from the bay of the penal colony. And now in the Helm Room Nemo took the wheel, standing in one of the glowing twin eyes. Gathering speed he ploughed the waves, straight for the unsuspecting hull. Like suns the eyes burned beneath the waves – Nemo in the monster's eye: his brows and handsome cheeks writhing, his eyes driving, driving toward an exultation. Along the rail of the helpless ship hands pointed frantically, shouts broke out. 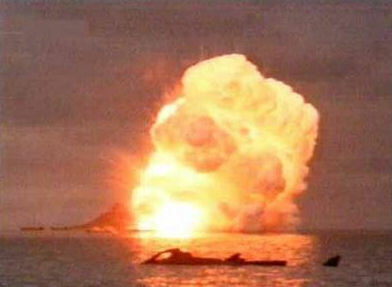 The Nautilus screamed, two balls of fire in the sea -- and rammed! How much of Captain Nemo – is Walt Disney himself? Nice – but what about Nemo’s endlessly fascinating, eternally driven character? The Disney Nemo is considerably more developed than Jules Verne's. Verne conceived a resolute, extraordinarily resourceful man of genius and action with an encyclopedic knowledge of the sea and much else besides. But Verne's Nemo only once hints to Professor Aronnax, very vaguely, at what ails him; never spells it out. The two attacks on warships the Professor and his companions witness are less acts of aggression than of retaliation for unprovoked attacks on the "sea monster." (The ramming of the U.S.S. Abraham Lincoln, which caused Ned Land, the Professor, and Conseil to tumble overboard, was pinpoint, Captain Nemo explained: a warning to mind its own business, not an attempt to sink). Except rhetorically, Verne’s Nemo is not at war with the surface world; rather he travels his undersea world in lonely satisfaction and meditation about all things that pique his curiosity, so long as they don't require lengthy sojourns above the waves. This is Nemo’s justification, at the book’s climax, for sinking the man-of-war rather than escaping it, as he easily could. Whose man-of-war? Not till the near-climax of a later novel, The Mysterious Island (L’Ile Mysterieuse), do we get an explanation. According to William Butcher, who supplies endnotes and other critical material to the Sidney Kravitz translation (Wesleyan University Press, Middletown CT, 2001), Verne originally made Nemo a Pole and the “accursed nation” Russia. But the publisher, who wished to sell books in Russia, nixed it. So both Nemo (“No one” in Latin) and the accursed nation remained anonymous. The success of 20,000 Leagues, however, led Verne to write Mysterious Island as a kind of sequel. In it another group of castaways, this time on a volcanic island, receive fortuitous supplies and experience nick-of-time rescues, thanks to an invisible benefactor who, in the final pages turns out to be old Captain Nemo, now alone and dying. This time he does tell his tale. He reveals that he is in fact an Indian prince named Dakkar and the “accursed nation” is none other than France’s (favorite) enemy, England. Prince Dakkar -- fabulously rich, educated in Europe, trained as a scientist – happens to be the instigator of the Sepoy Mutiny, in punishment for which his family was slain, and from whose brutal defeat he and a few companions barely escaped with their lives. Escape they did, though, to remote Pacific islands, where one way and another they constructed the Nautilus and henceforward lived by their own – that is, Dakkar’s – law, and beneath the sea. Many more explanatory details are filled in, but at last Nemo has a backstory to make his hatred and vengefulness plausible. The Disney script transforms this tale, taking it further. Disney’s Nemo – not an Indian prince but a cosmopolitan European – has been a slave-laborer in a prison colony. The prisoners’ main task was mining and hauling nitrates and phosphates to flagless warships that would take them to an unnamed nation to make munitions for sale and export. Why was Nemo a prisoner? The laconic explanation he gives is unclear because contradictory. 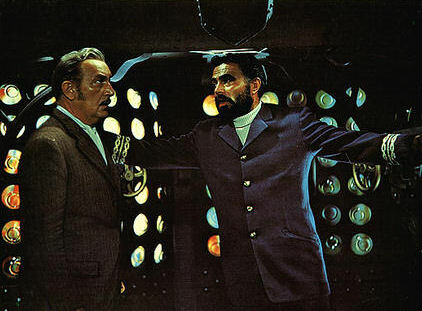 Earlier in the film, when he shows Professor Aronnax the prison colony – Rorapandi, “The White Man’s Grave” – he relates that he and other prisoners seized a warship and “fled beyond maps” to a remote island he dubbed Vulcania, where they built the Nautilus. But later – defending his unprovoked sinking of the warship – he says he was imprisoned and (by implication) tortured to reveal the secret of his “submarine boat and the energy that propels it,” hinting it was already built before he was enslaved at Rorapandi. Unless he was recaptured after escaping Rorapandi and building the Nautilus ... well, there is good reason not to look too closely into Nemo’s revelations. They are, in any event, the expostulations of a deep rage. The main point of the latter revelation is that “when they failed [to extract the secret from him] they tortured my wife and young son to death.” Motivation! And it is wrung from him at the moment he has just committed mass murder -- the ruptured warship sinking, exploding past the giant porthole – and just the moment the revelation of motive is most poignantly liable to win our horrified sympathy. The tedious details of parts procurement and logistics, not to mention the trial-and-error of planning and constructing the Nautilus, we don’t need or want to hear. As in a dream, the fact of the Nautilus is before our eyes, and how it got there ... is another story (we won’t sit around for). Disney gives Nemo specific motive for vengeance, and shows him exacting it in the worst (but also most exciting) manner – something Verne is so fastidious to evade he leaves the one incident analogous to the Rorapandi attack so far off-stage, and Professor Aronnax and his two companions so drugged, the Professor does not figure out what might have happened before the very end of the book. Disney replaces abstraction with action, travelogue with plot. But I use “Disney” loosely, and this leads me back to my question: how much of Walter Elias Disney is in Captain Nemo – either directly or, more interestingly, indirectly? But insouciance about finances never extended to creative preparation. Walt picked the property – a book that had long fascinated him – and spent a full year in pre-production, after scrapping initial plans to animate 20,000 Leagues, before he began to hire crew for a live action film. The crew then spent another full year of pre-production on the script, the miniatures, a brand-new sound stage with water tank, and hundreds of other preparations. The Disney studio had made six semi- and full live action films before this: two blended with animation – Song of the South and So Dear to My Heart – and four without – Treasure Island, Robin Hood, The Sword and the Rose (a/k/a When Knighthood Was in Flower), and Rob Roy. (The last four had been made entirely in England, using Disney earnings that post-war British law prohibited from leaving the country.) This would be the first complete live action film made at the Burbank studio. According to Fleischer, when Disney asked him to direct he asked Disney if he could bring along his scriptwriting partner, Earl Felton. Disney had chosen Fleischer because he liked The Happy Time, a critically acclaimed low-budget Stanley Kramer comedy directed by Fleischer and scripted by Felton. Disney agreed to Felton and the partners began brainstorming the mostly plotless Verne novel into a script that would hold and excite a movie audience. Whether Walt Disney identified in any way with Captain Nemo, or any of the other characters, as he had, say, from boyhood with Peter Pan, is one intriguing question. What is clear is that, although at the same time he was producing True-Life Adventure films like The Living Desert and The African Lion, it was less marine biology that cast a spell on him than submarine technology -- particularly the fact that Verne had made it all up and yet much of it came true. A spell even greater than the one cast by prescient technology, though, was cast by the wonders technology made possible. 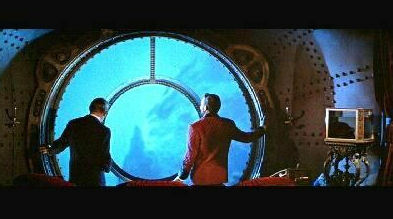 The Professor exploring the Nautilus with inexhaustible curiosity, standing in awe at the mountains and sea creatures gliding past the giant porthole, is Disney himself. But he is probably not the only Disney gazing out the porthole. 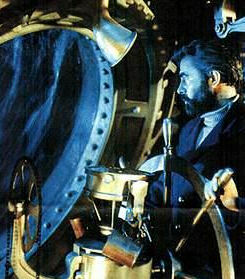 Walt must have been equally taken with the figure of Captain Nemo – man of vision, man of action. Genius – pacifist -- terrorist. Tyrant driven to exterminate tyranny. Disney’s Nemo, absolutely consistent with but far more dynamic than Verne’s, actually does the deeds Verne’s Nemo merely hints at or only threatens. He consigns the three castaways to immediate drowning on deck as he takes the Nautilus under – in order to test their courage and loyalty to one another. Convinced they will die together, they pass; and he resurfaces. He lurks for the nitrates-bearing ship of the “accursed nation,” rams and sinks it with all hands – prison slaves as well as masters. (In the book he does the same, but off-stage, leaving the attentive reader – and Professor Aronnax – only the barest suggestion.) The book Nemo is as brilliant, cruel, and resolute as the movie Nemo, but the movie Nemo is incomparably stronger because he does it all front and center -- terrifying, awe-inspiring. An irresistible villain-hero to millions in the theater, and no less to his producer. Just how much characterization and dialogue Disney, a brilliant story man, contributed to the Fleischer-Felton script may never be known. But Fleischer and Felton did not write in a vacuum. Peter Ellenshaw, the film’s matte artist, and Roy E. Disney, brother Roy’s son, contribute brief but significant observations to the Special Edition DVD that suggest where Walt’s direct influence dissolves into the indirect. Fleischer and Felton were new to the Disney studio, although they had probably heard tales. 1953 came a dozen years after the famous Disney cartoonists’ union strike, but neither Disney nor his employees had entirely recovered. Although the animators had won a nominal victory, Disney had retaliated against the leaders, in flagrant violation of the National Labor Relations Act. He got away with it, in large part because World War II, the studio’s occupation by the U.S. Navy, and Disney’s forced-draft recruitment into the training film business had helped protect him from real consequences. After the war Disney used a number of tricks learned during the labor struggle to do as he pleased with his staff, with continued impunity. Walt had a way of immersing himself in an idea. He would sort of go into a trance, or he wouldn’t hear you; and his eyes would stare, and his mouth would move, and you would see that he was going through some part of that scene, he was acting. In his mind he had gone through the whole thing. He acted out everything he was describing. He’d seen the space, he’d seen the action, he was part of it. Inside and outside the studio Walt Disney was legendary for his ruthless single-minded pursuit of innovative perfection in the art of animation, and of dominance in the animation industry. He knew what he wanted, and he went for it, cost be damned. So even if Walt had not involved himself in the script, writer and director had a lot to draw on. Disney’s quitting-time visits and evening marathons must have vexed Felton not a little, and perhaps made him add strokes and edges to the character of Captain Nemo that Walt -- un-self-reflective -- did not recognize. A wink – maybe a game of winks – between Felton and Fleischer. Fleischer was, after all, the loyal son of Max Fleischer, producer of Popeye and Betty Boop cartoons, and long-time “bitter rival” of Disney’s. He was very grateful, it should be said, for the offer to direct an A movie after many years directing or producing B movies and other low-budget films (although one of them, Design for Death, did win a Best Documentary Oscar in 1948). He told Disney he would be thrilled to take the job, but could not give a definite yes until he had consulted his father. Disney said fine. Richard immediately phoned Max, who told him to grab the opportunity, and tell Disney he had great taste in directors. Still, Richard Fleischer would have grown up hearing about a very different side of Mickey Mouse’s papa than the public heard. So it can only be supposed – and I do -- that at the time the harried Earl Felton and the son of Max Fleischer honed their script, along with and in spite of their larger-than-life boss, they gave it touches inspired by their uncredited editor. Yet it should also be said that one of the most significant additions of the script to the Verne narrative probably came from Walt himself. This is the motivation for Captain Nemo’s invitation to Professor Aronnax to sojourn aboard the Nautilus in the first place (“The secrets [of the ocean depths] ... are mine alone, but ... I would be willing to share [them] with you.”) even as (“You came [from the U.S.S. Abraham Lincoln] as an enemy to destroy me!”) he orders Ned Land and Conseil cast into the sea. 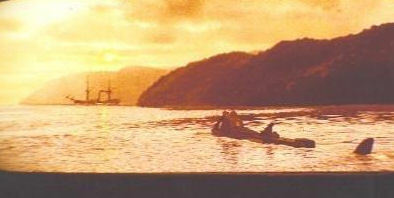 He renews the invitation after the Professor, refusing to desert his friends, stands with them on the submerging deck. “I found out what I wanted to know,” says Nemo, sparing them all. But what he wants to do with Aronnax, ultimately, is not revealed till just before the movie’s climax. And as the castaways escape, the island of Vulcania – borrowing from the last pages of Mysterious Island – explodes in mushroom clouds. The Nautilus up ends and succumbs, with the Captain’s dying words echoing in a crescendo of somber triumph. Nemo’s positive, progressive motive for courting the Professor, however provisional, and especially his dying words, have Walt Disney written all over them. A brief but pertinent digression. I don’t think Disney ever intended to present Nemo as a tragic hero, but inadvertently he came very close. What costs Nemo true tragic stature is the peripateia preceding his fall. The discovery of Vulcania by the much badder guys, the anonymous bullet in Nemo’s back may smack of nemesis, but they are not Nemo’s acts, and are too remotely self-provoked to count as proximately caused by him. Ned Land’s bottled messages are the proximate cause. The unprovoked attack on the nitrates ship, which has all the marks of a climactic act of hubris, and which in fact drives the Captain near mad himself, happens in mid-film, too early to be a climax, and too much else follows. So at the end only Nemo’s demolition of his base and the sinking of the Nautilus approach the stature of the tragic hero’s classic catastrophe. Then the reprise of Nemo’s dying words, while reassuring us that the film does not judge him a thorough villain, but in fact finds grounds for a partial redemption – finishes him off as tragic hero once and for all. A Captain Ahab, with his last breath and last ounce of strength ramming harpoon into immense inhuman adversary (“From hell’s heart I stab at thee!”), Captain Nemo is not. But he remains the most intriguing character Walt Disney ever produced. The end of Captain Nemo was not the end of Disney’s fascination with what Nemo had wrought. 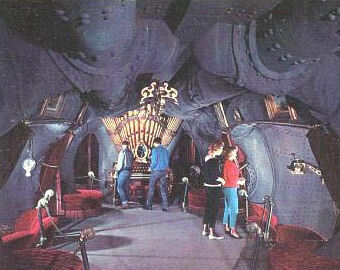 "Our Friend the Atom," the “Tomorrowland” show, opens with Captain Nemo’s Nautilus quietly plying the undersea passage to Vulcania. Once again Vulcania blows up in clouds suspiciously mushroom-like. Yet you will search in vain through Disneyland, all 50 years of it and more, for any attraction – ride or exhibit – called Our Friend the Atom. What happened? The short answer is: I have not been able to find out. I have checked three Disney biographies (four if you count Schickel’s The Disney Version), books by Disneyland designers Herb Ryman and John Hench, and numerous other books on the park, particularly Disneyland: The Nickel Tour by Bruce Gordon and David Mumford. None say why; nor does the 2007 Walt Disney Treasures DVD entitled "DISNEYLAND: Secrets, Stories & Magic". The "secret" stays secret. (John Hench’s sketches for the Carousel of Progress and the Ford Pavilion produced by Disney for the 1964 New York World’s Fair look remarkably like the sketches of the atomic exhibit Walt holds up at the start of "Our Friend the Atom." Maybe that is part of the answer.) General Dynamics, which was to have sponsored the atomic exhibit, and which built the U.S. Navy's nuclear-powered submarine fleet, did advise and supply technical data for the design of the Disneyland “nuclear” (actually diesel-driven) submarine fleet that debuted in 1959. 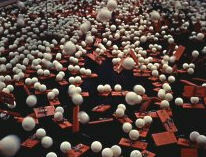 Years later the Adventure Thru Inner Space (sponsored by Monsanto) miniaturized guests to travel among water molecules, even panic at the approach of an atom’s nucleus – but an oxygen atom, not a uranium atom. Too unsettling for an amusement park? Then why do a show and a book on taming the atom? The more Walt studied the subject, the more troubling doubts arose about safety, safeguards, and ineluctable devil of nuclear waste? Not bloody likely. We can go on and on. Unless the Disney Archives have a document to yield, the exercise is pointless. For his Magic Kingdom Walt stuck with space travel and shrugged atomic power. And it was enthralling, when I entered two summers later. Actually to walk through the Nautilus! 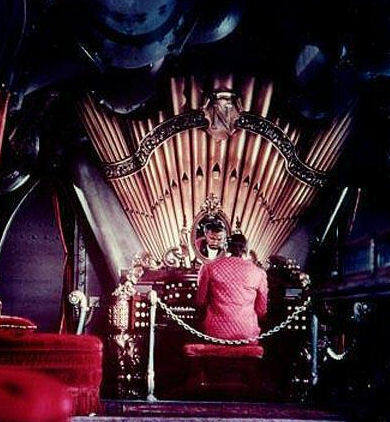 Nemo’s elegant salon, complete with vermilion divans and gray steel bulkheads, aquaria, library, crowning brass pipe organ. Out the giant porthole (in what was obviously not water) writhed the tentacles of the giant squid, giant beak chopping. Through the diving chamber (at the bottom of whose flooding hatch lay a floor, but not the ocean floor, and lucky pennies). Up to the helm where Nemo would stare out the glass eyes of the sub, speeding through the waves toward a warship. 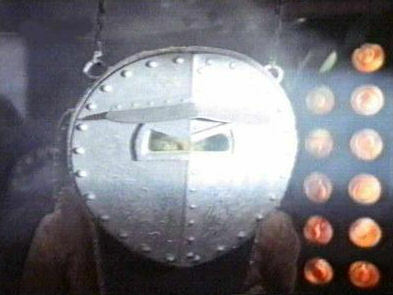 And at last the high-humming engine room – the hundred flickering little disc-windows of whirling rainbow fires – and the lead mask, hung for us to peer through at the furnace door that rose and shut on “the veritable dynamic power of the universe” (... just a big bright light bulb). But anyway! They wouldn’t have a real atomic fire in Disneyland for people to get radiation from -- so I forgave. And then there was ... the Monsanto House of the Future. Tomorrowland, in 1955, was supposed to be a vision of 1986. I remember the outside of the House – who could forget it? – but the inside, all of a piece, toured in a minute, I don’t. By 1967 the House of the Future, popular for ten years, was judged by the (post-Walt) Disney company to be showing its age, and it was removed. “Nothing so quaint as an antique futurism.” Happily, though, it’s all over the Internet. 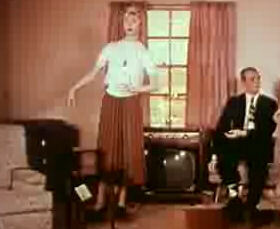 (See, for example, Daveland or Houses of the Future-Past.) 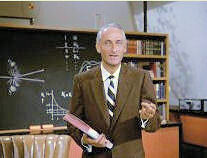 And, frankly, when 1986 did come by, and go the way of 1967, and 1955, it failed to measure up to ... Tomorrowland. Opened shortly before our family arrived, summer of 1957, the Monsanto House of the Future was the very image of any house of the future anyone could imagine. Whiter than white, glassier than glass, all-plastic, standing up out of a sculptured garden like a toadstool from Outer Space. Perched on a central stalk, the cantilevered wings spread cruciform: southwest, northwest, northeast, southeast – kitchen and bathrooms in the center, then living room, family/dining room, children’s bedroom, master bedroom. ... [F]loating furniture, appliances that disappeared at the touch of a button, wall-sized TV, ... microwave ovens, plastic sinks with adjustable heights, shelves that automatically lowered out of cabinets, telescreen intercoms ... electric razors, electric toothbrushes, and even [speaker] phones that dialed themselves. Overhead, Trans-Ceiling Polarized Lighting Filters filled the rooms with a warm plastic glow. There was even a Climate Control Center that constantly monitored the temperature and humidity while it sprayed out the scents of flowers, pine trees, and sea air. There were electric controls for just about everything, and it was all made of plastic ... Resinox, Resimine, Scriptite, Polyflex, Ultron, Lytron, Nytron, and more! The interior was entirely synthetic, even to polyester clothes in the closets. Floors of Cambrian Corlon supplied a thick vinyl sublayer, cushioning the foot. On top lay Chemstrand Acrilan and nylon carpets and throw rugs. A “deep, fur-like pile” of Acrilan also upholstered the wall-hung, contoured sofas, plump with urethane foam. Vinyl covered other chairs and all the walls, and urethane foam cushioned all the beds. Plastic louvered screens adjusted sunlight and folding styrene dividers closed rooms for privacy or opened them for guests. But the great showcase within the showcase was the bright General Electric kitchen at the center. Armstrong vinyl covered the floor and Textolite and Melamine laminates all the counter and cabinet surfaces. Washable vinyl wallpaper filled the in-between spaces. Push buttons controlled range, oven, and other appliances, all flush with the wall or counter tops. An ultrasonic dishwasher rose from and vanished back into one counter to clean dishes without water. And meats and vegetables could be preserved, not in a freezer, but at room temperature, thanks to the newest development from Argonne National Laboratories: a machine which by supervoltage electron beams radiated the food and killed all present bacteria as well as any that might venture along, inadvisedly, over the next few months. Maybe not a house you'd like to live in yourself -- but you'd like a friend to, so you could go over there all the time. There’s a slight additional resonance. The famous quest Jason and his Argonauts embarked on was not only to fetch the Golden Fleece but to bring the ghost of Phrixus back to his native land, because only then would the land recover from a generation of blight and once again prosper. This also suggests that the Golden Fleece, in the earliest legends, might have been not only the vehicle for the return of the ghost or soul of Phrixus, the rightful king. To riff on a suggestion of Frazer’s: the ghost of Phrixus was precisely the spirit of rightful kingship which needed to be passed on to the legitimate heir of the kingdom of Iolcus -- Jason. A long-lasting succession crisis embroiled the Disney Studio after Walt’s death, until resolved after 15 years or so by Walt’s nephew, Roy E.
“Spirit or Soul of the King,” then, would likely be the primary ancient meaning of Golden Fleece. But that would not mean much to a modern audience. And it straineth wit to impose the Golden Fleece template on the Magic Kingdom and its discontents. Another approach to the significance of the Golden Fleece for the Disney kingdom is more promising. To get the Fleece, Jason would have to subdue an unsleeping dragon or serpent. Very familiar situation for mythical heroes the world over. But in fact Jason does not have to fight or slay this dragon/serpent. True, before reaching the dragon, who guarded the tree in a temple or grove or Garden of Ares where the Golden Fleece hung, he also had to yoke two fire-breathing brass bulls, plough the Field of Ares, sow it with serpent’s teeth, and defeat the armed men who sprang up from the dragon’s teeth to attack him. A series of feats worthy a hero, but he accomplished none of them by his own might and prowess. His lover Medea, the sorceress, had bathed him in a magic lotion enabling him to do all these things and slay his adversaries. She then cast a spell, as well as drops of a sleeping potion, on the eyes of the unsleeping dragon. Jason grabbed the Fleece and they all skedaddled back to Greece. In this respect, the Golden Fleece is the prize, the reward, the trophy for conquering, by symbolic action, hostile forces of the natural world. Taming the wild. Harnessing the “dynamic power of the universe,” to practical uses. Tricking the genie back into the bottle and forcing it to submit to Allah and benefit, not destroy, humankind. Turning a grove of oranges into a fabulous amusement park – More-Than-Just-an-Amusement-Park. Yet notice. Not only is Jason incapable of performing the three heroic tasks on his own, when he finally snatches the Fleece, he does not even have to slay the dragon. Medea does the real work – and the seizure of the Golden Fleece is ... an anticlimax. Even, in terms of the entire Jason and Medea story, a nonclimax. Anticlimax or nonclimax is an essential ingredient of thrill rides at any amusement park or carnival. (If roller coasters have any climax, it comes at the beginning – the sleep plunge after the long slow teasing climb – not the end where you would expect one.) It’s in great part the lack of a satisfying climax to a thrill ride that keeps the customers coming back for more. Disneyland takes this principle much further. Walt built it to be a comedy without end – always evolving – never achieving climax, either in history or in a family’s daytime visit. The nightly fireworks, which parents might use as an excuse to call it a day, are more a semblance than a true climax, since hours of evening frolics remain for those not yet exhausted; and You Can’t Do Everything in a Day, anyway. Or two or three days. In 1957 none of the rides I went on climaxed, they just ended (with the arguable exception of Mr. Toad’s Wild Ride, at the end of which a bewigged and ferociously grinning Judge sends you to Hell). The Autopia, the Mark Twain, the Santa Fe & Disneyland train, the Skyway, the Mad Hatter’s Tea-Cups, the Peter Pan, Snow White, and Alice in Wonderland rides, the Jungle Ride (and in 1960 the Submarine Voyage) – all glide to an end without climax. By 1960 the Matterhorn bobsleds did end with a climactic splash. I presume the more recent Splash Mountain ride ends with an even bigger splash. Certainly the Indiana Jones ride (2006) reaches climax when the giant boulder is about to roll over you and you drop into a black hole. (Not bad for, to me, an otherwise tedious neck-wrencher.) I might also except from the non-climax rule Space Mountain which, hurtling, twisting, and turning you through a pitch-dark tantalized by light-show pricks of galaxies, is all climax from start to finish, and to my taste gets better and better each ride. (California Screamin’ in the companion California Adventure Park, a classic (steel-framed) roller coaster accelerated an extra power or two beyond the usual, is exciting as Space Mountain until decelerating in the usual three braking waves in lieu of climax.) There is even a comic kind of climax at the end of the Haunted Mansion ride, when you see mirror reflections of friendly green ghosties sitting beside you as you trundle out. Throwaway climaxes here and there, though, only serve to keep you going toward the Big Climax That Will Never Come. But Disneyland offers more than rides, thrilling or otherwise. Part of the tension always building toward the Big Climax That Never Comes is the never-ending tension between Disneyland-as-Just-an-Amusement Park vs. Disneyland-as-More-Than-an-Amusement-Park. And that More means more than the “educational” exhibits (always free in the days when every ride required a ticket), entertaining or not-so as they might be. No. More, for Disney, was a vision reaching out to much more of the past, present, and future than it could ever embrace. Disneyland is a story – a story of stories that never end. And, during the 1950’s and for the next fifty years, the everpresent threat of atomic war ... never reached climax. For which we’re all grateful. The unbearable tension of facing the threat of the climax could be counted on to lapse in exhaustion, and a turn away toward distraction -- amusement. And the always threatened but never arriving climax was useful for encouraging hope it could be avoided (and, so, the nuclear arms race not necessarily suicidal, but protective, and therefore indefinitely continuable, without serious challenge) ... and encouraging a forgetting that the threat has never gone away. Donald Duck and nephews Hughie, Dewey, and Louie don’t have a Medea to help them defeat the Sleepless Dragon and other perils; but they do have the Junior Woodchucks’ Guidebook and Reservoir of Inexhaustible Knowledge. Triumphantly (in “The Golden Fleecing,” Uncle Scrooge #12, Dec. 1955, reissued by Gladstone Publishing Ltd., Prescott, AZ; written by Carl Barks, whose storytelling is much more dramatic, and comic, than my redaction might lead you to think) they lead Uncle Scrooge to the Golden Fleece. Now can the World’s Richest Duck reduce a fabulous symbol to a utilitarian fact. And a week later, attired in flaming gold, retrieve his old thrownaway broadcloth coat from the trash can. The day before we went to Disneyland the first time we saw a movie star, that is, a TV star. It was just down from Hollywood and Vine. My father had gone into a restaurant to see if we had to be dressed up. We were parked across the little street. I noticed a white-haired old man in baggy suit walking with difficulty down the sidewalk on a cane, hanging on the arm of another old man. I recognized his mutton cheeks in a second. "Perry White! Kathy, Connie, that's Perry White! On Superman, Perry White!" We bounced and turned and pointed, and ducked and hid. "Something's wrong with him," one of the girls said. It was true. It was a shock. Perry White, boss of Clark Kent on The Daily Planet, was always pounding his desk: "Great Caesar's ghost!" -- “Don't call me Chief!" But we were looking at an old man barely able to walk. "Well, why don't you ask him for his autograph?" my mother said. "No no!" Kathy and I shouted and ducked. His face brightened; he'd caught sight of us. "But he'd probably be thrilled to give it to you!" Connie started to roll down the window. I threw her hand off and rolled it up again. Perry White and his friend had halted and were smiling at us now. They said something to each other through their smiles. Perry White hesitated, his eyebrows moving expectantly. We kept peeking and ducking. "Oh, you kids are ridiculous! He's probably had a stroke, poor man, and it would make him happy to know you recognized him." That's just why I was so embarrassed to get out, to have him see some kid see him so old and sick. Nodding, smiling, Perry White and his friend moved into the restaurant, just as my father was coming out. He stopped and held the door for them. He'd never heard of Perry White. "What! You mean you didn't ask him for his autograph? Aaww!" Very disgusted. We stayed that night at the Hollywood-La Brea Motel down the street from Graumann's Chinese. Now we were on the Santa Ana Freeway to Anaheim. Smog hung clay red in the morning sky. I had my sunglasses on but they did no good. I saw the signs ANAHEIM but we were still passing motels and houses and gas stations. Where were the orange groves? Disneyland grew out of an orange grove. We had almost passed it when my mother cried first and then the girls. Behind the busy traffic on the freeway passed castle turrets and pennants, and figures in skyway buckets, and the sleek needlenose of the Rocket to the Moon. I experienced the beginning of a feeling I didn't like. But the turn-off saved me. Soon we were on a two-lane gravel-strewn road and rows of orange trees fanned on the left. We turned twice again and suddenly there it was: the parking lot. And just beyond, the Victorian clock tower of the Disneyland railroad station, a train just chugging out. I craned, but could see nothing of the freeway. And what's more -- my eyes had stopped smarting! The sky was higher here, though still overcast. We parked and got out. I had to stare at the blacktop and pebbles of the parking lot, just to believe my sneakers were standing on the same acre as the entrance to Disneyland. The girls hopped. My father in his reddest Hawaiian shirt, movie camera in hand, leaned against the car, legs crossed, and stuck his lip over his tongue, with teasing eyes. "I want to travel in style," he said. The trams crossing the parking lot were free. The walk to the gate would take all of five minutes. "Come on," I complained. "Let’s go !" "Just hold your horses. Here comes a tram now." Kathy crossed her legs and pranced. "I have to go to the bathroom!" The tram zig-zagged on noiseless tires toward our car. "All aboard for Disneyland!" said the sunglassed driver. He works here everyday, I thought. Everyday, all day, he just drives this tram. I gripped the folded stroller while my mother held Maureen. We lurched when the tram started and jiggling together we grinned. The gates of Disneyland were rolling toward us. http://poserworks.com/1_categories/vehicles/htm_boats/htm_mouseover/pw_nautilus_mo.htm (mouseover exploded illustration of the Nautilus and all its compartments). More of JR Foley's work can be found at jrfoley.com. "The Museomound of Tara" in FlashPøint #12.